Despite serving as president for just one term, Nelson Mandela will forever be remembered as the most influential leader South Africa has ever known. He is part of the country's fabric - not just because he was the first black president, but because he worked so tirelessly both before and after his election to bring peace and racial equality to a country seemingly irreversibly divided by apartheid. Today, he is affectionally referred to by South Africans by his clan name, Madiba. His image appears on the national currency, and there are Nelson Mandela memorials all over the country. In this article, we take a look at the destinations that shaped Madiba's life, and the legacies that can still be seen there today. Nelson Mandela was born on July 18 1918 in the village of Mvezo in South Africa's Transkei region. The Transkei would later become the first of 10 black homelands established under the apartheid regime, and for many years its residents had to pass through border control to enter South Africa. Today, it is a traditional Xhosa homeland known for two things - its rugged, unspoiled natural beauty, and its identity as the birthplace of Mandela and many of his contemporaries (including fellow activists Walter Sisulu, Chris Hani and Oliver Tambo). Mandela went to school in Qunu, located just north of Mvezo. It was here that he was given his Christian name, Nelson - previously he was known to his family as Rohlilahla, a Xhosa name meaning "troublemaker". Today, visitors to the Transkei no longer have to present their passports - the region was reincorporated into South Africa after the fall of apartheid. There are two main stops for those wanting to follow in Madiba's footsteps - the Nelson Mandela Museum in Mthatha, the Transkei capital; and the Nelson Mandela Youth & Heritage Centre in Qunu. The former offers an overview of the president's entire life, based on his book, Long Walk to Freedom. It also hosts temporary exhibitions and contains a display of the gifts given to Mandela by South African and international luminaries during the course of his lifetime. The Qunu center focuses on Mandela's early life with a heritage trail that takes you to landmarks like his old school building and the remains of the church where he was baptized. In 1941, the young Nelson Mandela arrived in Johannesburg, having left the Transkei in order to escape an arranged marriage. It was here that he completed his BA degree, began training as a lawyer and became involved with the African National Congress (ANC). In 1944, he co-founded the ANC Youth League with Oliver Tambo, who would eventually go on to become the party's president. Mandela and Tambo also set up South Africa's first black law firm here in 1952. In the years that followed, the ANC became increasingly radical and Mandela and his peers were arrested several times, until eventually in 1964, he and seven others were sentenced to life imprisonment after the Rivonia Trial. There are several places in Johannesburg to learn more about Mandela's life in the city. Your first stop should be The Mandela House in the township of Soweto, where Mandela and his family lived from 1946 to 1996. In fact, Mandela came here first after finally being granted freedom in 1990. Now owned by the Soweto Heritage Trust, the house is full of Mandela memorabilia and photos of his life before being sent to Robben Island. Liliesleaf Farm is another must-visit for Mandela fans in Johannesburg. Located in the suburb of Rivonia, the farm was the secret center of operations for ANC activists during the 1960s. Today, the museum tells the story of Mandela and other instrumental freedom fighters and their struggle against the apartheid regime. The arrest that eventually led to Mandela's 27-year imprisonment took place outside the town of Howick in KwaZulu-Natal on August 5 1962. Mandela had recently returned from an overseas trip to gather support for the ANC and was traveling from Durban to Johannesburg disguised as a chauffeur. After 17 months of evading the apartheid police, he was apprehended and arrested on charges of incitement and leaving the country without a passport. Today, the capture site is marked by a monumental sculpture which was unveiled on the 50th anniversary of Mandela's arrest. Designed by artist Marco Cianfanelli, it comprises 50 laser cut steel columns that create an image of the former president's face when viewed from the correct angle. 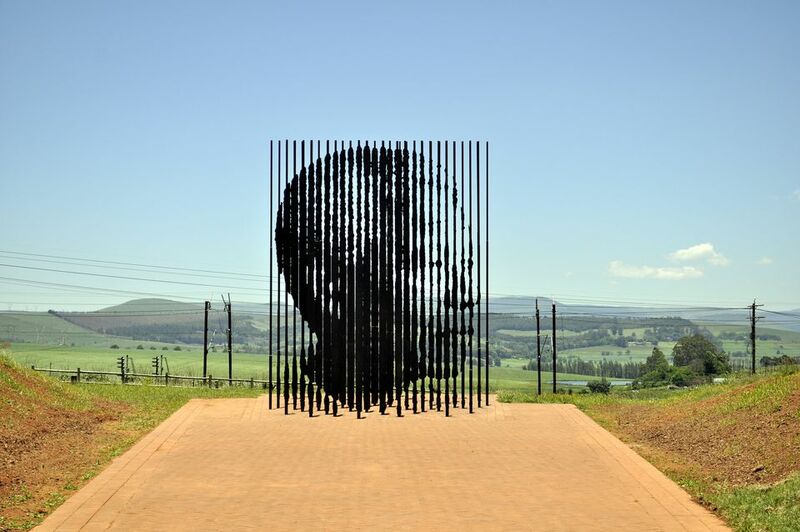 Together they cover a width of almost 100 feet/30 meters and represent the idea that the many make up the whole in celebration of Mandela's vision for a united South Africa. The sculpture is situated at the end of a long, paved walk intended to evoke his own long journey to freedom. Operated by the Apartheid Museum in Johannesburg, the site has become a popular place of pilgrimage for Mandela fans. After the Rivonia Trial, Mandela was sent to the political prison on Robben Island, located in Cape Town's Table Bay. He stayed here for the next 18 years, undergoing gruelling forced labor in a quarry during the day and sleeping in a tiny cell at night. Now a UNESCO World Heritage Site, Robben Island is no longer a prison. Visitors can explore the cells and the quarry were Mandela worked on a half-day tour from Cape Town, under the guidance of an ex-prisoner who will give a firsthand insight into what life was like for Mandela and the other activists imprisoned here. Other stops on the tour provide information about the island's 500-year history, including its time as a leper colony. The highlight, of course, is the emotional visit to Mandela's own cell. After battling with prostate cancer and tuberculosis, Mandela was transferred to Pollsmoor Prison in Cape Town and later spent several months in hospital. Upon his release in 1988, he was transferred to Victor Verster Prison, located in the Cape Winelands. He spent the final 14 months of his 27-year imprisonment in relative comfort, in a warder's house rather than a cell. In early February 1990, the ban on the ANC was lifted as apartheid began to lose its hold. On February 9, Nelson Mandela was finally released - just four years later, he would be democratically elected as the country's first black president. The prison is now the Groot Drakenstein correctional facility. Visitors come to pay their respects to the giant bronze statue of Mandela, erected in the very place where he took his first steps as a free man.